After some time enjoying the water, the animal then jumps out of the pool and climbs a tree. The panda can be seen lying on its back and moving its feet and arms around. At one point the animal shakes its entire body as if its trying to get up. Finally, it gets out of the pool of water. It shakes itself off to get rid of the water and climbs a tree. The panda then rolls around on the grass. In an excited mood, the animal climbs the tree again. For a long time, scientists weren’t sure if giant pandas were bears or perhaps more closely related to raccoons. Now we know that giant pandas are indeed members of the bear family, similar to other bears in their general looks and the way they walk and climb. An example is the panda reserve system which was established as part The National Conservation Project for the Giant Panda and its Habitat of 1992. Today there are around 67 reserves. Human interaction within reserves is minimised, and infrastructure is limited as is removal of trees and thus giant panda habitat. 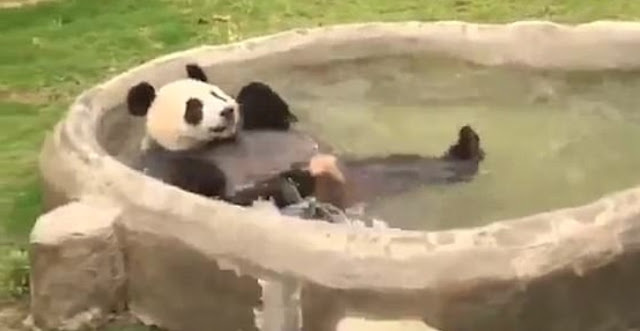 Responses to "Adorable panda cub enjoys an extremely fun bath time"